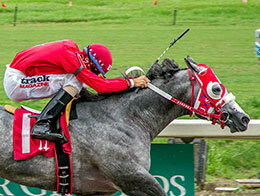 Mid-CIty Stakes(RG3) winner San Lorenzo Corona will be among nine Louisiana-bred sprinters entered in Saturday’s 400-yard, $40,000 Opelousas Stakes (R) at Evangeline Downs. OPELOUSAS, LA—NOVEMBER 6, 2018—Nine Louisiana-bred sprinters, headed by recent stakes winners San Lorenzo Corona and Sweet Bru, have been entered in Saturday’s 400-yard, $40,000 Opelousas Stakes (R) at Evangeline Downs. A 4-year-old son of Coronas Leaving You trained by Jose Luis Sanchez III for owner Rogelio Marquez Jr., San Lorenzo Corona will be making his first start since September 8, when the stallion scored a 1 1/2-length victory in the 440-yard, $40,000 Mid-City Stakes (R) at Fair Grounds. San Lorenzo Corona drew post 9 and will be ridden by Eddie Sanchez. Sweet Bru races for Jose Ortiz from the barn of Gary Mason. A 5-year-old daughter of Embrujo FG, the mare is coming off of a head victory in the 250-yard, $40,000 Lakeview Stakes (R) at Fair Grounds on September 8. Sweet Bru drew post 7 and will be ridden by Floriberto Maldonado.